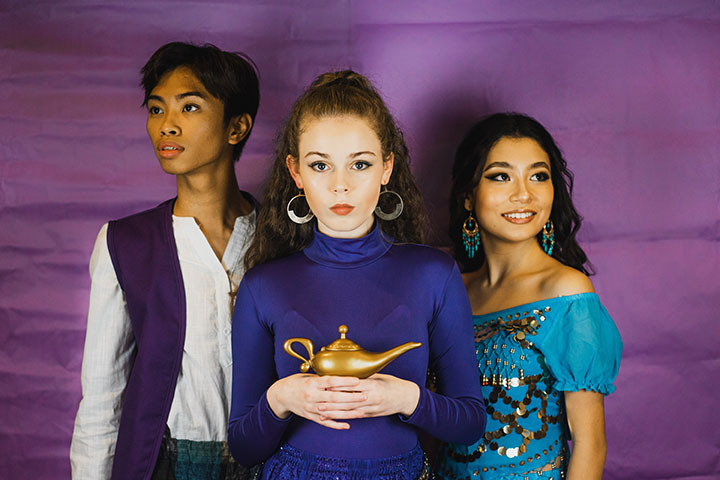 HOME CULTURE Community POPs goes to magical middle-east with Aladdin Jr.
Aladdin, Jasmine and Genie are ready to keep audiences entertained as POPs presents Disney’s Aladdin staring Feb.n 15. 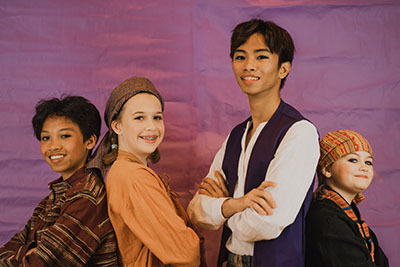 Pacific Okinawa Players upcoming youth production Disney’s Aladdin JR.is a spectacular musical adventure based on the 1992 Disney film and the 2014 Broadway adaptation that is sure to be a crowd-pleaser for all ages. Ring bells! Bang the drums! You sure gonna love this exciting stage adaptation of the legendary tale of the lovable thief with the heart of gold! Join Aladdin (RJ Arlan), Jasmine (Sabrina Wrachford), and the fast-talking, wisecracking Genie (Grace Rogers) as they discover mystical caves, take magic carpet rides, and outwit the evil sorcerer, Jafar (Cristian Colorado). The musical includes favorite Alan Menken songs such as “Friend Like Me,” “A Whole New World,” and “Prince Ali,” as well as wonderful new songs and colorful new friends added for the Broadway production. The cast boasts 38 incredibly talented young people ages 8 to 18 who bring their talents to the stage, publicity and choreography for the show. Aladdin JR. is directed by Christine Smith with musical director Melanie Bales and assistant director Kelly Dolan. This trio has worked together to lead many POPs blockbuster shows over the past three years, including Willy Wonka Jr, POPs Magical Music of Disney, and The Little Mermaid Jr. Other lead production team members include Morgan England (stage manager), Lisa Dolan (choreographer), Anne Rogers (costumer), Gary Hughes (light design), Josh Bales (sound design), and Maggie Smith (props). Aladdin JR.will run Feb. 15th-24th, with evening performances (7 p.m.) on Fridays and Saturdays and matinee performances (2 p.m.) on Saturdays and Sundays. All performances will be at the Camp Foster Community Center Auditorium. Tickets are $5 for youth (ages 3-HS students) and $10 for adults. Tickets can be purchased in advance at www.pacificokinawaplayers.org. Remaining seats will be sold at the door while supplies last. The box office opens 1.5 hours before the show time. Disney’sAladdin JR.is presented through special arrangement with Music Theater International (MTI). All authorized performance materials are also supplied by MTI. www.MTIShows.com. The Pacific Okinawa Players is an all-volunteer non-profit community organization dedicated to providing high quality live theater to all military and SOFA status personnel stationed on Okinawa, Japan. We strive to promote education and continued development of the performing arts through the POPs Ed Kirsten Scholarship Fund. For more information please visitwww.pacificokinawaplayers.orgor email us at popsmembership@gmail.com.